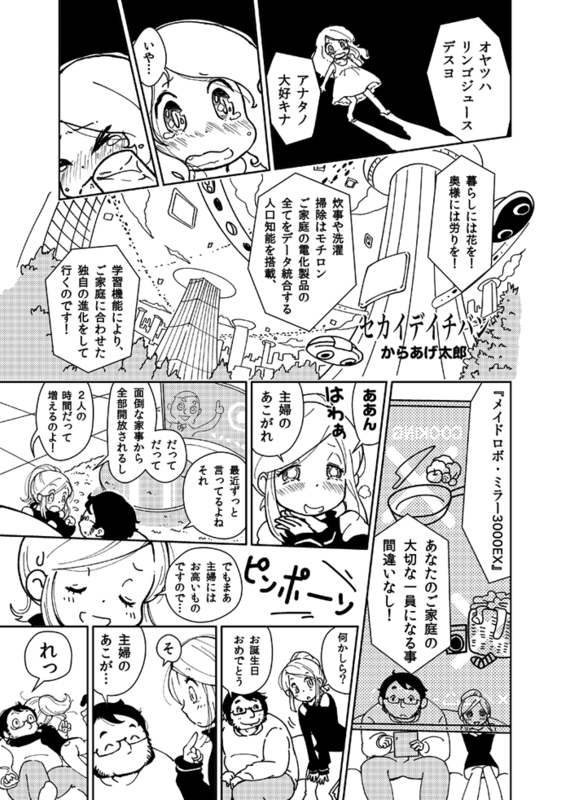 I'm taking part in Contrary Tales, a joint-project fairy-tale comic that's coming out at Comitia 102! I'll be drawing a 15-page story. It's a Snow White manga that really isn't a Snow White manga. There's a lot of other folks who'll be drawing a lot of other manga, so anyone who's interested, please do pick it up! We plan to distribute it on Nov. 18 from space H10b, Ikebashiya! For details, see here! I absolutely adore comics Karaagetarou releases on COMITIA. I wonder if this is a sample or just a small comic. Your snack is apple juice! You've been saying that all the time recently. Flowers for your life! Sympathy for your wife! ..and with its learning function, it evolves uniquely to match your household! It'll become a valuable member of your household, you can bet on it! This comes equipped with population intelligence that integrates data on all household electrical appliances for cooking, laundry, and of course, cleaning. ...and we could spend more time together!